This easy Easter centerpiece post brought to you by The Hershey Company. The content and opinions expressed below are that of this mama loves. One of the things my kids love to do is to help make the table special. Making the table special can be on a random Tuesday for lunch, or it can be a full-blown holiday gathering with linens and fine china. They don’t care. They love to make it special. Hershey’s sent a whole bunch of their delicious Easter candies to us and challenged us to do something fun with them…and at first we did Origami Easter boxes to use as a centerpiece, but it wasn’t really an “oh wow” so while we’re still using those on Easter, they aren’t our craft. 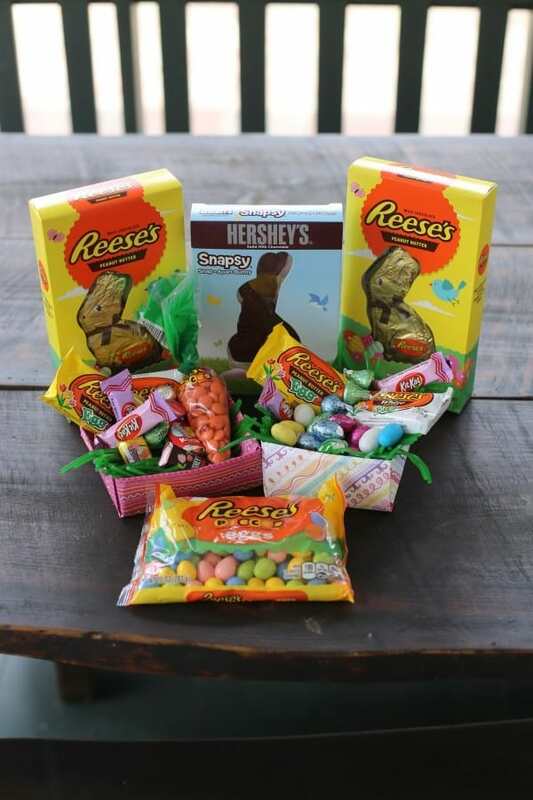 The Hershey Easter offerings are a staple in our baskets every year, as well as in baking we do. 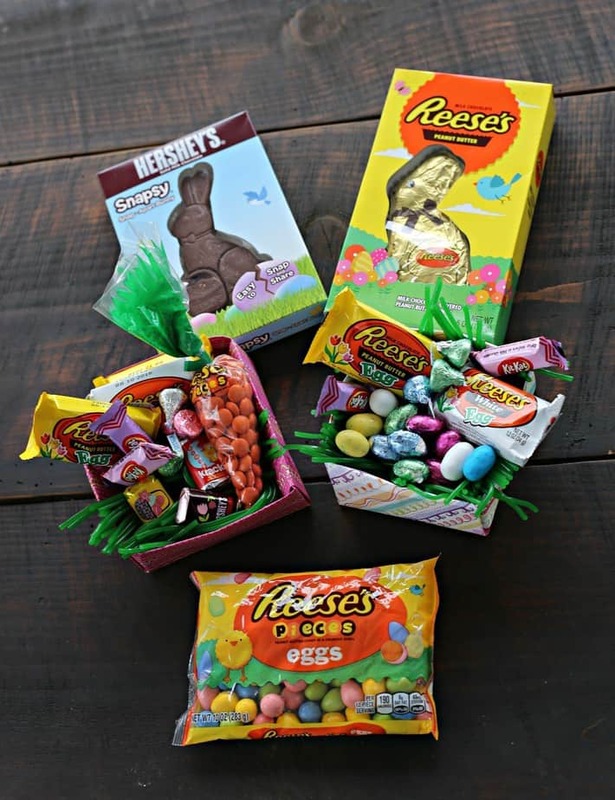 With a wide variety of new and classic treats from Hershey, you’re sure to fill this year’s Easter basket with sweet treats the whole family will enjoy, too. 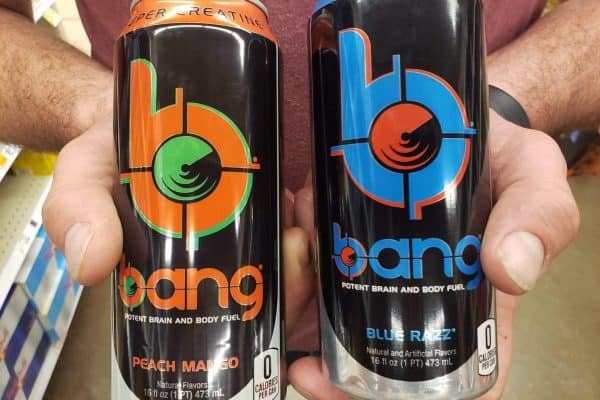 I love that they are so easy to find- available at retailers nationwide! We decided to have some fun with flowers because it’s finally spring… and my 10 year old wanted to show you how good she’s getting with her origami practicing. 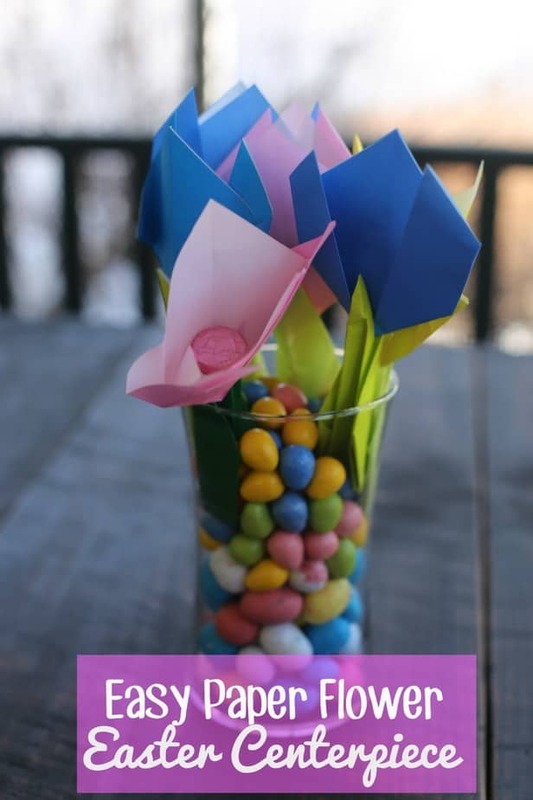 So here is our easy Easter Centerpiece Craft Idea- Paper Flowers in Candy with a sweet surprise. Origami Paper Flowers for easy centerpiece idea from brett martin on Vimeo. We did use tape to secure the tulips onto the stems, especially since we were adding weight to them with the candies. 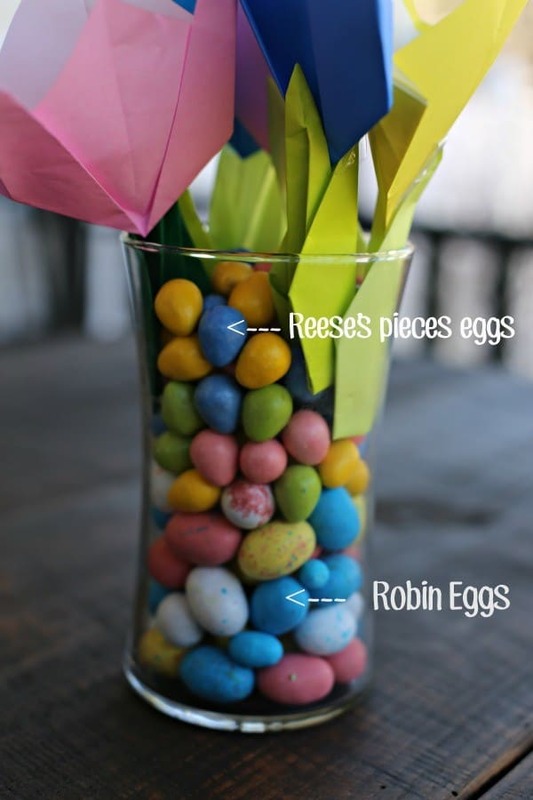 Pour your Whoppers Robin Eggs candies into your glass vase, followed by the Reese’s Pieces Eggs candies (adjust the amount by how large your vase is). Jelly beans would also be super cute as stones, but someone might have eaten all the Jolly Rancher jelly beans while prepping for the photos and we don’t want to name names (me). Add your flowers into the vase and arrange as you like. That’s it. The kids are SO excited to bring our centerpiece to my brother’s for the dinner table on Sunday, and all three were happy to take part in creating it. 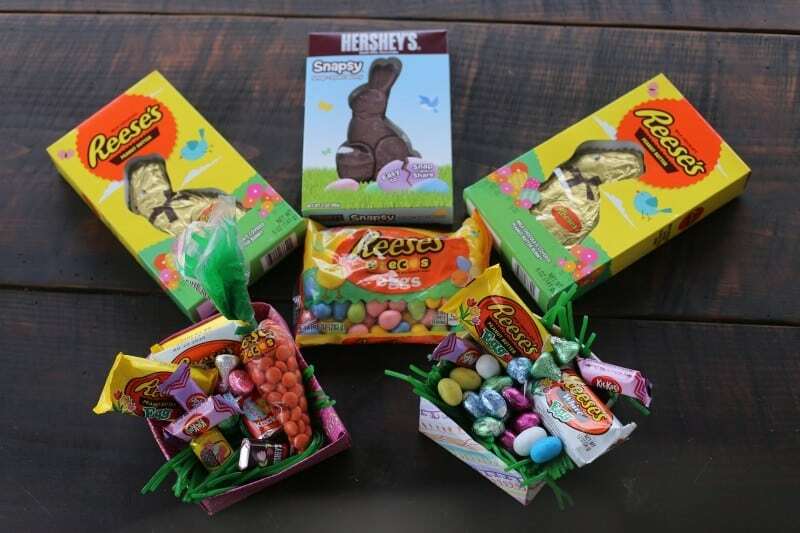 Find other ideas, read more Easter crafts and treats over at Celebrate with Hershey! I love this, it’s so cute and so simple. It’s great-and wonderful. I haven’t made origami paper craft since I was a kid. I love how the centerpiece turned out! Good job! This is so lovely. I’ve seen a similar decoration at a nursing home that the old women did. This is such a cute idea. I will have to make one for my table this weekend. The colors matches the chocolates. On another note, I wish those easter chocolates are available in my country too. Do you have other color Easter chocolates? We just have the regular colored ones, they don’t have special colors for any other occasions. It turned out super cute. I have a surplus of candy since my husband and I both bought some without talking to each other first. Going to use some of it to make a centerpiece. What a cute centerpiece for an Easter table. Perfect for Spring! Looks adorable! This is such a cute idea! 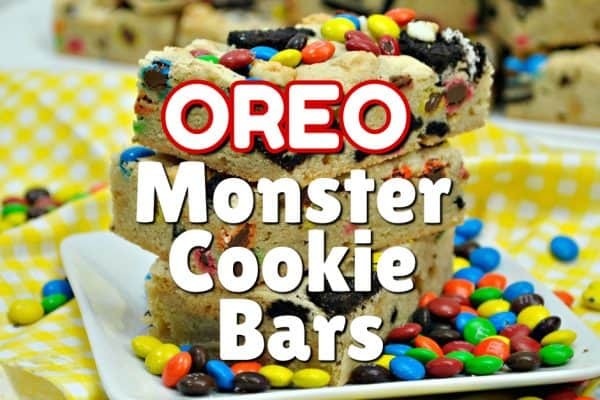 I think I have everything to make this at home right now! This is a great craft to get the kids involved in Easter lunch preparation. I love the idea of making your own centerpiece…so much cheaper and much more personalized! I love this center piece. I’m sure if I put it on my table, they kiddos would eat the candy after I put it put and it would be gone before Easter lunch or dinner. What a fun and festive idea for an Easter centerpiece! I think I could even handle this craft and the kiddos would love the candy at the end. Oh cute is this? I am not having Easter at my house this year we are going to a friends house. This might be fun to do with the kids and bring it over for Easter. That is such a great idea. 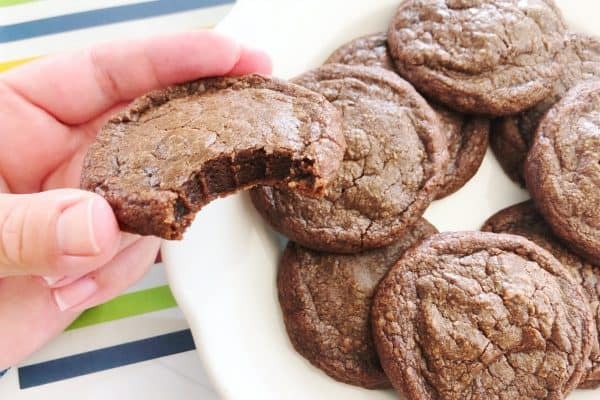 I love how easy this is to make. I Love it.